The would be JGB, three weeks. Did they turn it into a 3D jigsaw puzzle? Thought they must have been short of an aircraft! They've been doing BNE-WGA-ABX-BNE (JGO33) lately. Jetgos latest a/c arrived in Brissie on 5/11. 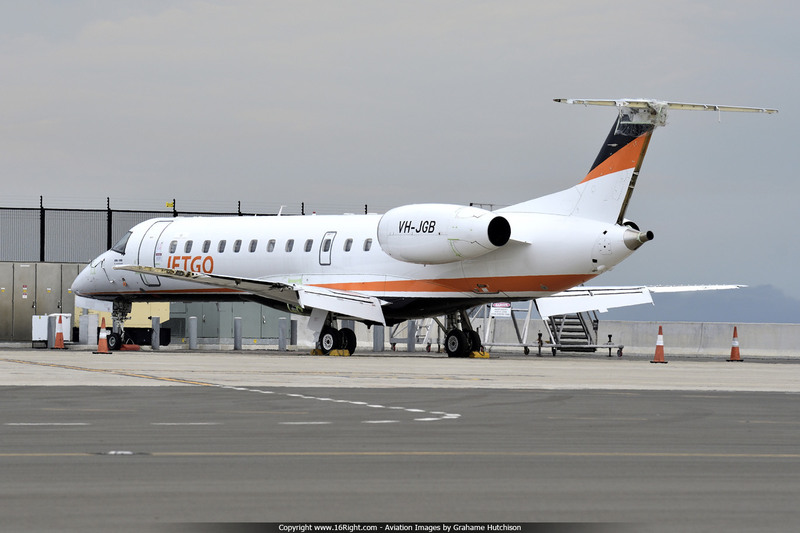 Does anyone know what is happening with JetGo ERJ135 VH-JGB? It has been at Sydney for three months. I notice that there were issues with ERJ135 VH-JZG on Friday where it was pulled out of service at BNE. The Brisbane to Wollongong flight was changed to VH-ZJG (after it had finished it's days duties at BNE) and arrived WOL late at 23.45pm instead of 14.50pm - 9 hours late. VH-ZJG remained on the WOL route the following day and the Albury & Wagga schedule was adjusted due to lack of aircraft. VH-JGB is still in Sydney and has no Rudder, Elevators, and Ailerons. The last flight I picked up on ADS-B for JGB was as JGO96 on 15/10/2017. This shot was taken on the KILO Apron on 29/12/2017.